Did you think about your New Year Resolutions for 2017 yet? 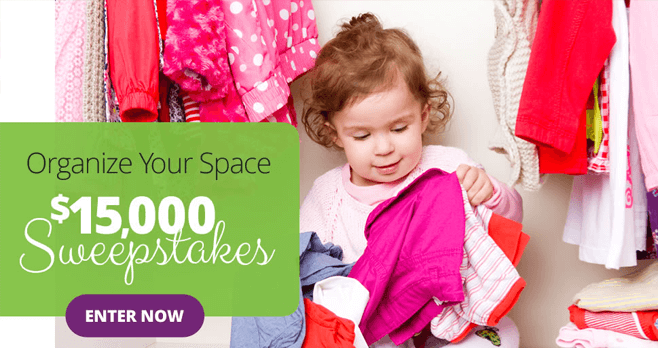 If one of them is being well organized in your life, Parents.com wants to help you by giving you the chance to win $15,000 to get started with home organization with the Parents Organize Your Space $15K Sweeps. All you have to do is register for the Sweepstakes at parents.com/15ksweeps now through April 12, 2017! Commencing on December 12nd, complete the 5 following steps to be entered into the Parents Organize Your Space $15K Sweepstakes. Visit the Sweepstakes page at Parents.com/15kSweeps. Click the “Enter Now” button to access the registration form. Join using your social login (Facebook, Google+, Yahoo) or complete the form by providing your email address and a password. If you are already a member, just log in. Fill out the entry form as directed. Click the “Submit” button to complete your entry. You will automatically receive one entry into the Sweepstakes. Want more chances to win? Complete and submit the online entry form at www.bhg.com/15ksweeps, www.Marthastewart.com/15ksweeps, www.fitnessmagazine.com/15ksweeps, www.marthastewartweddings.com/15ksweeps, www.eatingwell.com/15ksweeps and/or www.SHAPE.com/15ksweeps for more sweepstakes entries. Does it get any better? Enter as many times as you want! The more you enter, the more chances you have to win! Participation into this Parents Sweepstakes is open only to legal residents of the 50 United States and the District of Columbia. Must be 21 years of age or older to participate. Entries will be accepted until 11:59 p.m. CT on April 12, 2017. You may enter as many times as you wish throughout the Sweepstakes Period. Sponsor will conduct a random drawing from among all eligible entries received and combined from all Websites throughout the Sweepstakes Period to select the winner, on or about 4/19/17. Approximate Retail Value of the grand prize is $15,000. Sponsored by Meredith Corporation, 1716 Locust St., Des Moines, Iowa. For complete details, including Official Rules, visit www.parents.com/15ksweeps. i need to organize my room a mess.